Dermot Morgan was an actor and comedian who was a native of Dublin. He became famous for playing the role of Father Ted Crilly in the sitcom ‘Father Ted’. Dermot Morgan was born in Dublin on March 31st 1952. He was educated at Oatlands College, Stillorgan before going to University College Dublin (UCD) where he studied English and Philosophy. In 1974 he began working as a teacher at St. Michael’s College, Ailesbury Road in Dublin. He left his teaching post two years later to pursue his comedy career. Between 1979 and 1982 Morgan regularly appeared on ‘Live Mike’ on RTE (Raidió Teilifís Éireann) where he played several comic characters. The most popular character he played was a catholic priest called Father Trendy. He later made appearances on shows such as Kenny Live. However his comedy sketches, which were at times controversial were eventually dropped from the show. His comedy show ‘Scrap Saturday’, which began on RTE radio in 1988, became a big broadcasting success. The show lampooned several aspects of Irish life, especially its politicians. It was cancelled by RTE in 1991 much to the annoyance of Morgan. Dermot Morgan’s big break came in 1995, when he starred in the show ‘Father Ted’ on Channel 4. 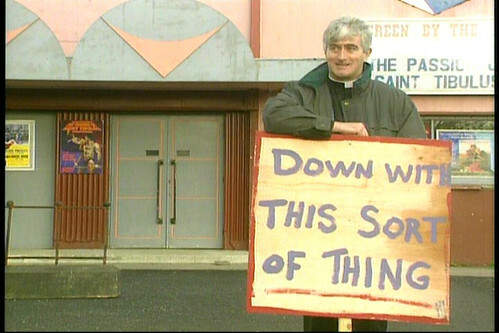 ‘Father Ted’ ran for three series with a total of 25 episodes. It was also shown on RTE, Nine Network in Australia and on ABC Television. Morgan died suddenly in 1998 having just completed the final episode in the third series of ‘Father Ted’. Dermot Morgan, actor and comedian died in London at the age of 45 in the year 1998 On This Day.